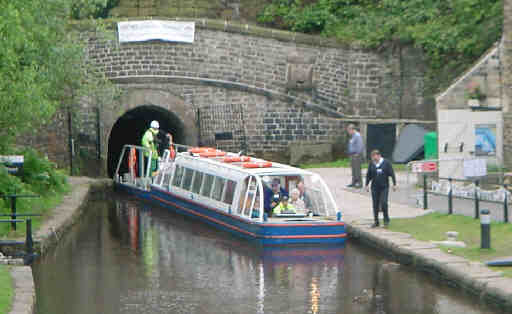 Visitors to Standedge Tunnel should aim for Tunnel End, near Marsden. Car parking is in the car park near Marsden railway station. From there it is a pleasant ten-minute walk along the canal towpath to Tunnel End. 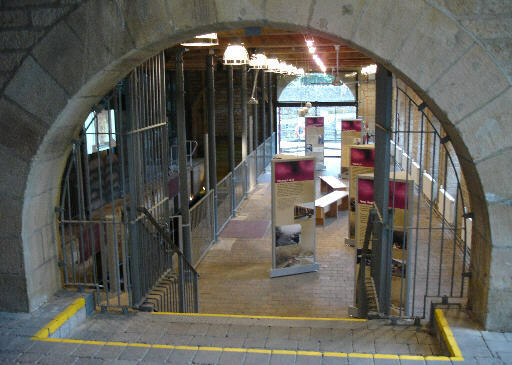 The former canal warehouse opposite the towpath at Tunnel End has been converted into a Visitor Centre, with displays telling the story of the canal and the tunnel. There is also a film about the canal showing continuously. Admission to the Visitor Centre is free and it is open on the same days as the tunnel trips (see below) and also daily during school summer holidays. A café is situated in Tunnel End Cottages next to the tunnel mouth. Inside Standedge Visitor Centre are boards telling the story of the canal and tunnel and a film showing continuously. 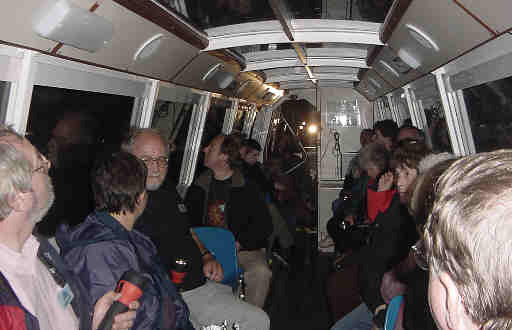 A highlight of a visit to Tunnel End is a boat ride into the tunnel. The boat trips start from Tunnel End Cottages at the tunnel mouth and go about 500 metres into the tunnel. When you arrive at Standedge, you can go into Tunnel End Cottages to book your trip. In 2013 the trips are running every day until the Autumn, but please check this before you set off. For dates and times of boat trips please check The Canal and River Trust's Standedge website for the latest information. 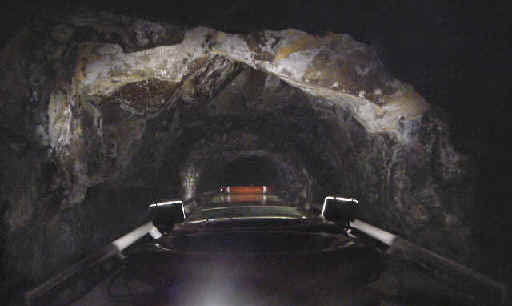 From 2009, boats will start going through the tunnel under their own power. But if you haven't got a boat then there is good news! There will be monthly through trips for passengers on the electric passenger module. These trips will be on the first Saturday of each month, with the first being on Saturday 4th April. The westbound trip leaves Tunnel End, Marsden at 9.00 am and the eastbound trip leaves Diggle at 1.00 pm. The fare will be £10 per person (£8 children and concessions) and places can be booked by ringing 01484 844298. Bus number 184 runs hourly through Diggle and Marsden, passing the top of the lane leading down to Tunnel End, for those who don't fancy making their return on foot over the moors. These monthly through trips are in addition to the regular short trips that run every day that the Visitor Centre is open. The short trip into the tunnel lasts about 25 minutes. The specially designed passenger boat has glass roof panels, powerful external lights and viewing platforms at each end. A guide explains about the tunnel to the passengers. Deep inside Standedge Tunnel on a through trip. 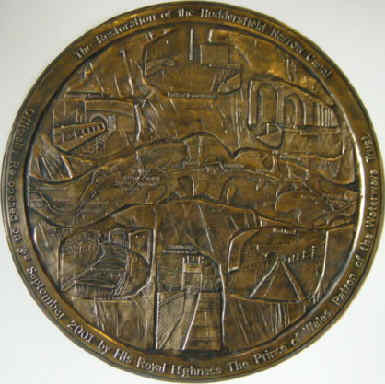 A large bronze plaque unveiled by Prince Charles when he officially opened the Huddersfield Narrow Canal in September 2001. The plaque depicts scenes from different parts of the canal. 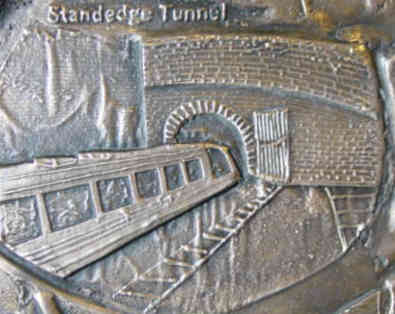 A detail from the plaque showing the Marsden portal of Standedge Tunnel.